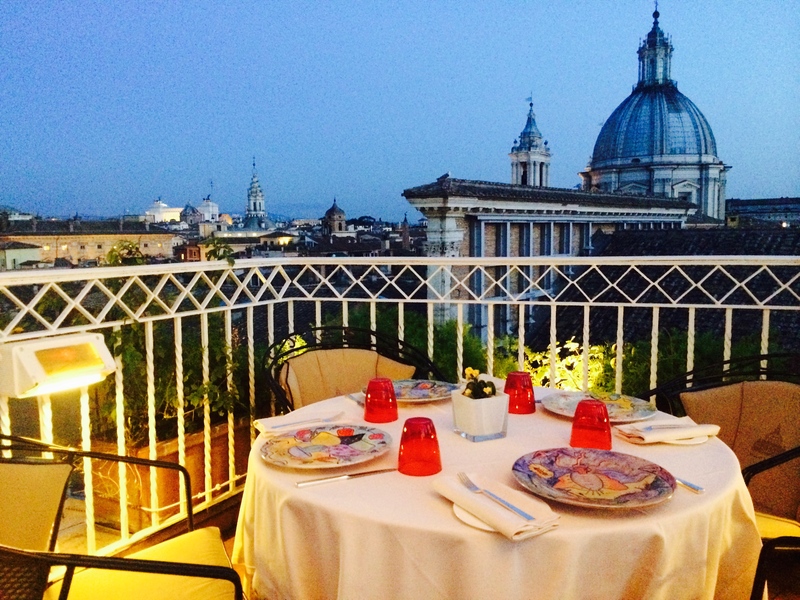 La Terrazza Bramante, a garden restaurant on top of the Hotel Raphael provides panoramic views of the eternal city. While enjoying a refreshing glass of Frascati wine at a small outdoor table near the Piazza Navona last September, I couldn’t help but notice the tall and lush Hotel Raphael across the street. The entire facade was covered with ivy and purple wisteria. As my eyes traveled from the front door entrance up the building to the top, I noticed some large umbrellas and wondered if it had a rooftop restaurant. I questioned my waiter about it and was told that it did. It was then I decided to enter the hotel and make my way to the top. I could only imagine the views of the city from this vantage point. Golden lamplight spilled through the entrance toward the street as I entered the Raphael. The impeccably dressed gentleman at the front desk took a copy of my identification and told me how to reach the elevator. 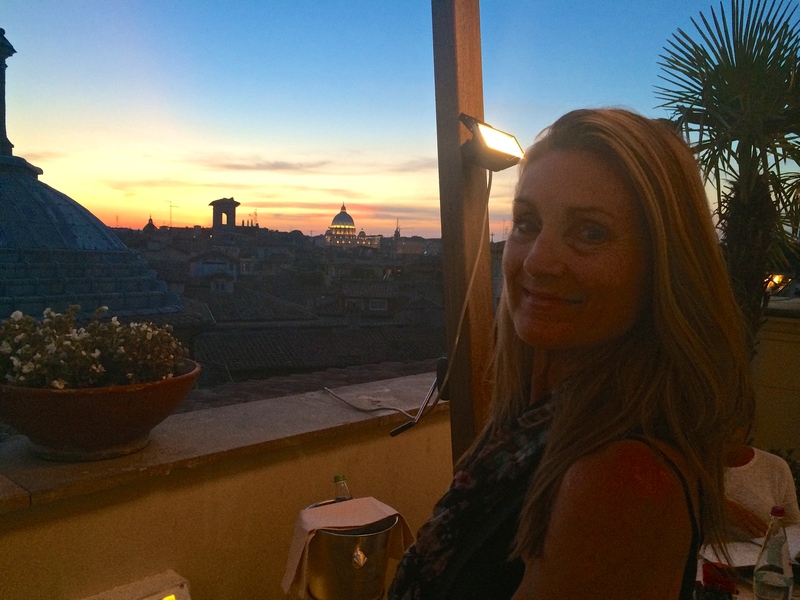 La Terrazza Bramante, the rooftop garden restaurant, was more exotic than I imagined it would be. 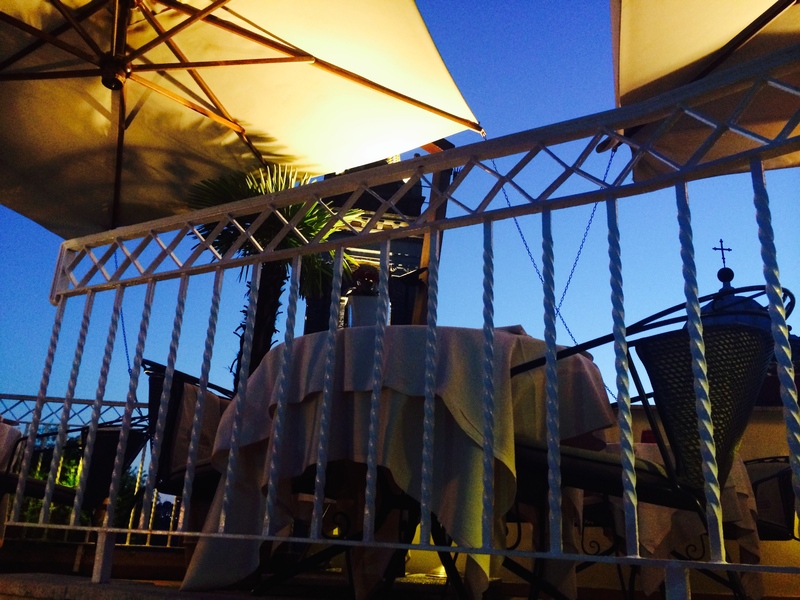 I had stepped off the elevator and into a multi-level terrace that offered elegant dining among tall fan palms. Large umbrellas provide shade for diners. This is what attracted me from the cafe across the street. 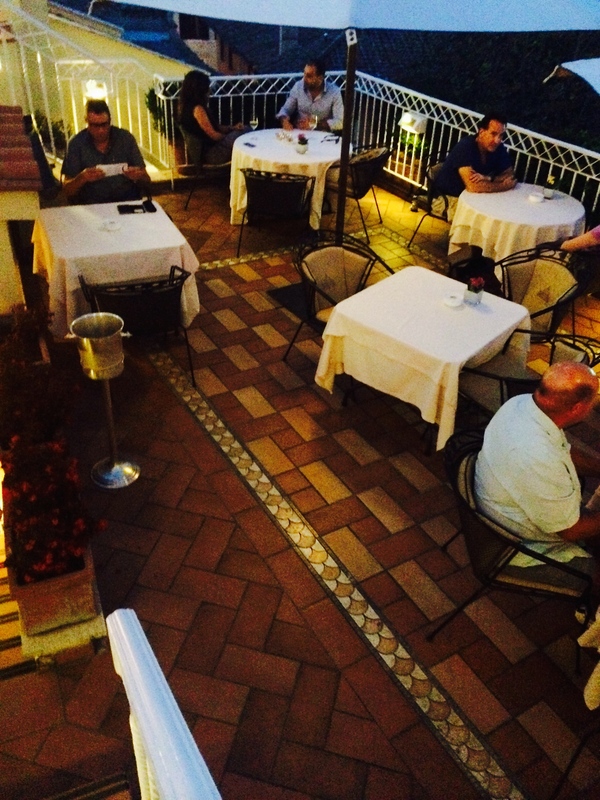 A scattering of diners begin to arrive as the dinner hour approaches. A handsome young waiter approached me and inquired if I would like a table. I accepted a menu from him and scanned the pages. A nice selection of gourmet organic, biodynamic vegetarian Mediterranean cuisine was on offer along with some of the best wines in Italy. 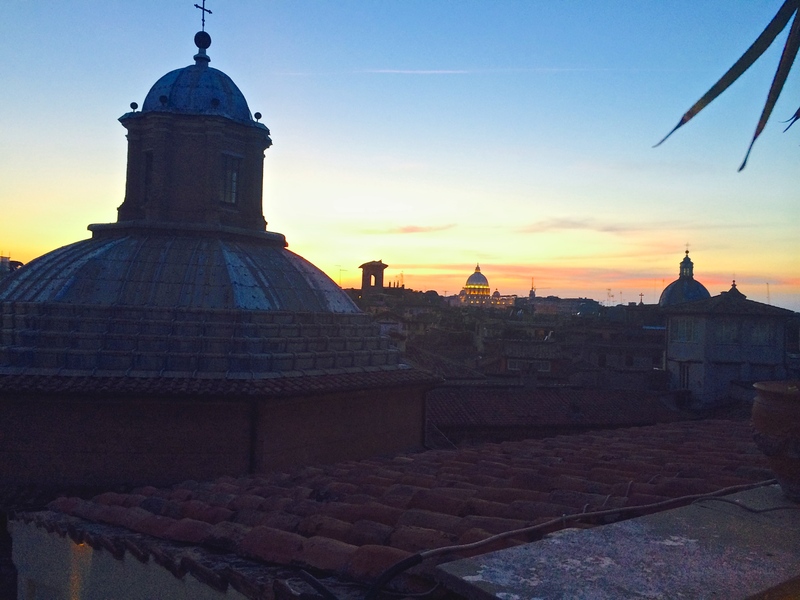 I wasn’t hungry for dinner yet, so I declined but asked if I could take a moment to enjoy the Roman skyline. He smiled and encouraged me to take my time. The nearly 360 degree view of the eternal city at dusk was intoxicating. The restaurant faces the Bramante cloister in the church of Santa Maria della Pace. The terrace overlooks several architectural wonders of Rome, including the Pantheon, Castel Sant’Angelo, and the National Monument of Victor Emanuel II. 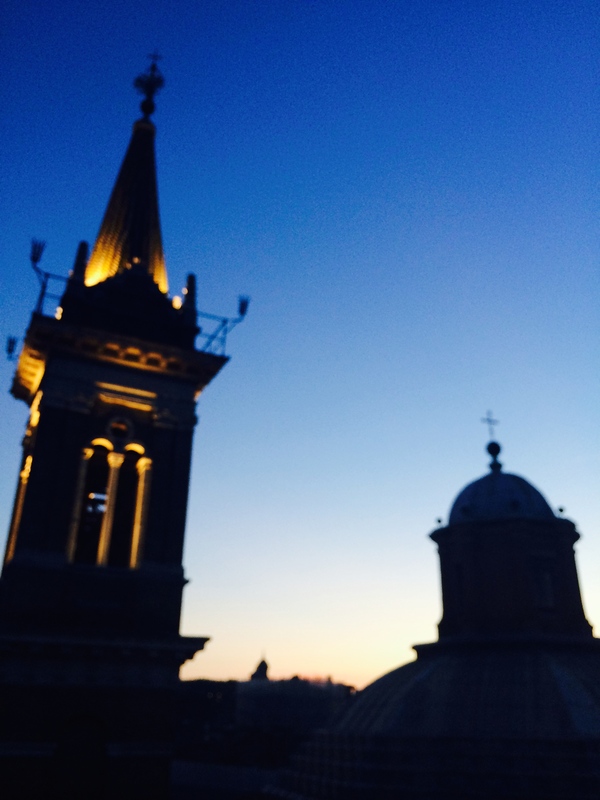 The dome of Santa Maria della Pace to the left and St. Peters Basilica in the center. The bell tower of the Church of St. Mary of the Soul, built in 1502. 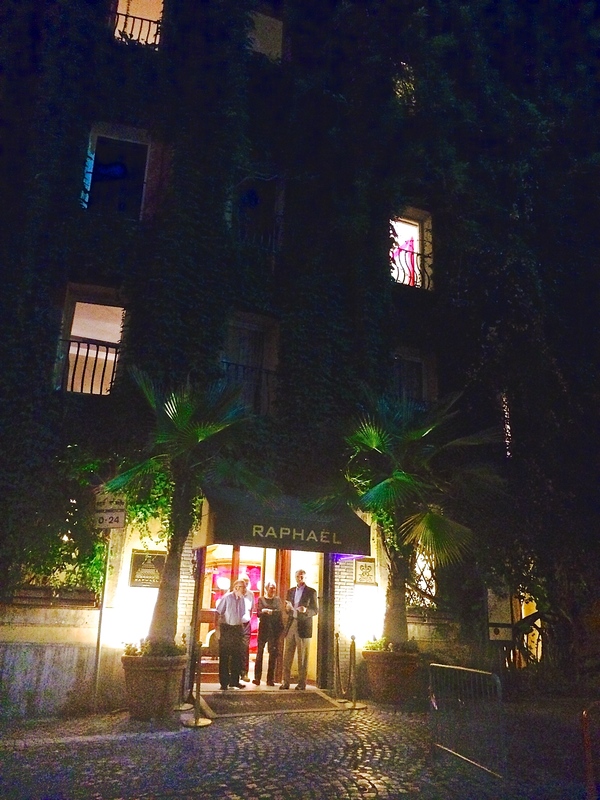 The building of the Hotel Raphael itself seems to have been around for hundreds of years. Its believed that a fresco in the Vatican Museum clearly shows the building already in existence in the sixteenth century city. Florentine developer Spartacus Vannoni remodeled the interior into The Raphael, a luxury hotel with two lower level floors, seven upper floors, a multi-level rooftop terrace and a restaurant in 1963. The 5 star luxury hotel is also a veritable museum of sorts. Artwork in the form of paintings, sculptures, antiques and a collection of Picasso ceramics are on public display throughout the building. American architect Richard Meier designed two of the executive floors which are of a modern decor. 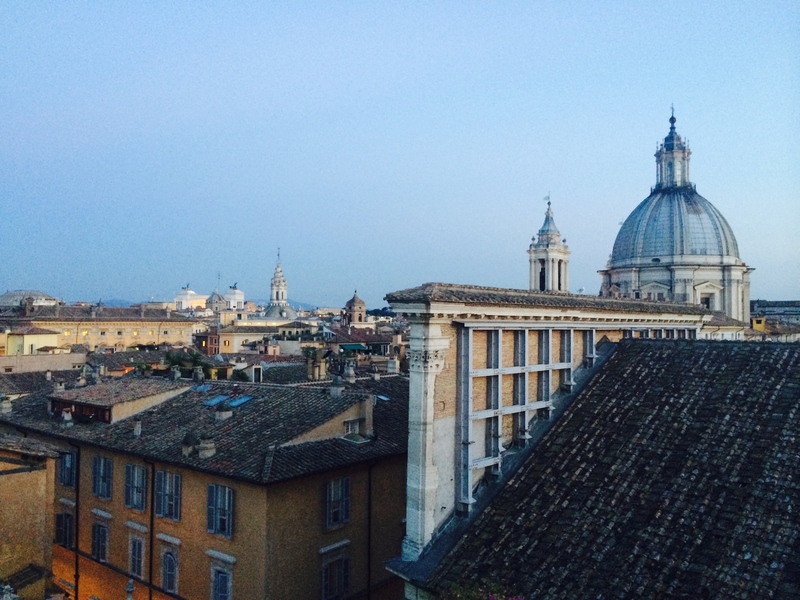 The ambience of the Hotel Raphael and La Terrazza Bramante rooftop restaurant left me with a yearning to return. In addition, the waitstaff were exceptionally friendly and cheerful. The hotel is nicely located and within walking distance to the Pantheon, the Trevi Fountain, Colosseum, Roman Forum and the Vatican. Beautiful views. 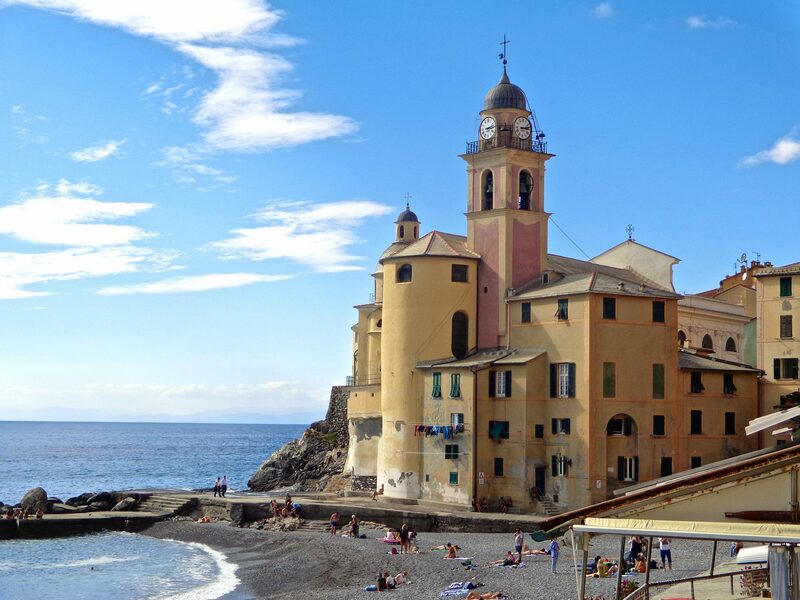 It looks similar to the views from the rooftop of the Grand Hotel de la Minerve right behind the Pantheon, beside Santa Maria Sopra Minerva. 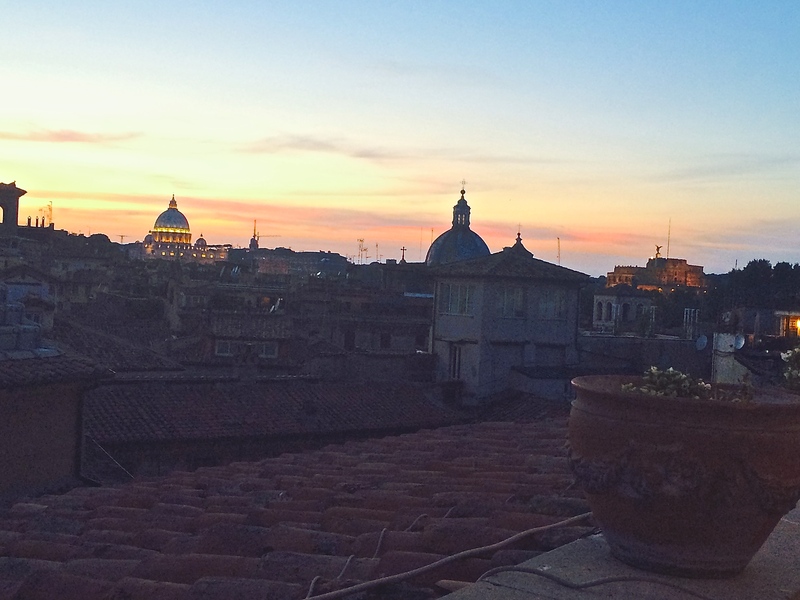 I’m sure there are several rooftop restaurants in Rome with gorgeous views of the Roman skyline! I will have to check out the Grand Hotel de la Minerve. Thanks for the comment. Gorgeous! I am THERE next time we are in Rome! Great views- what did you eat? I didn’t eat here since I had a huge lunch and wasn’t feeling hungry. But I would have….the menu was amazing! And a worthy one at that:) Always good to hear from you Sherri!